Perhaps I should be calling these posts "an outsider's view on attending the opera." The more I watch, the more I remember that I know absolutely nothing about opera. But that's okay: it just goes to show that you don't need to already know anything in order to go and enjoy a good show. So. 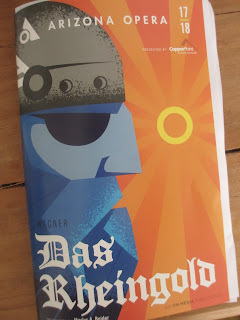 Wagner's Das Rheingold. From the Lord of the Rings-esque descriptions of this one, I had a feeling it would be one not to miss. An opera that's also a fantasy about nymphs and magical gold (that can be formed into a ring that ends up being cursed) and dwarfs and giants? Awesome, right? And it was. The first act probably was my favorite because, well, nymphs are great--and having them float around live in front of you in a sea of mist while singing opera just makes them even better. All of the fantasy elements were great fun to watch. The production choices were fascinating, too. The orchestra sat up on stage, and the orchestra pit could then be used for some of the other performers in certain scenes. For instance, it was the water in which the nymphs swam and played. A high platform ran the width of the stage above the orchestra so that performers could be up there above the musicians. And the giant screen was back on the far end of the stage, providing backdrops that moved with the rhythm of each scene. They did also use the semi-transparent screen that drops in front of the stage; projections on the screen allowed you to see the orchestra behind it while also seeing the images. And the giants. They stood towards the front of the stage (well, actually above what would be the orchestra pit) and in front of a small camera; this camera was linked to a big screen on one side of the stage that showed them live but in like black and white night vision or something like that. It gave them a creepy, WWI, Borg look. Rather than making the story feel "modern" (which I say in a negative sense--or I suppose I could just say "too modern" or "modern in the wrong way"), these elements just kept it all interesting and fresh (even though, since this was my first introduction to this opera, it wasn't exactly stale to me--but something can still feel fresh even if it's only new to you personally). The singers were wonderful. The giants had this striking way of projecting. And Loge had my attention the way he gave flourishes to both his singing and his movement. The music? It was . . . good. It just . . . dragged. 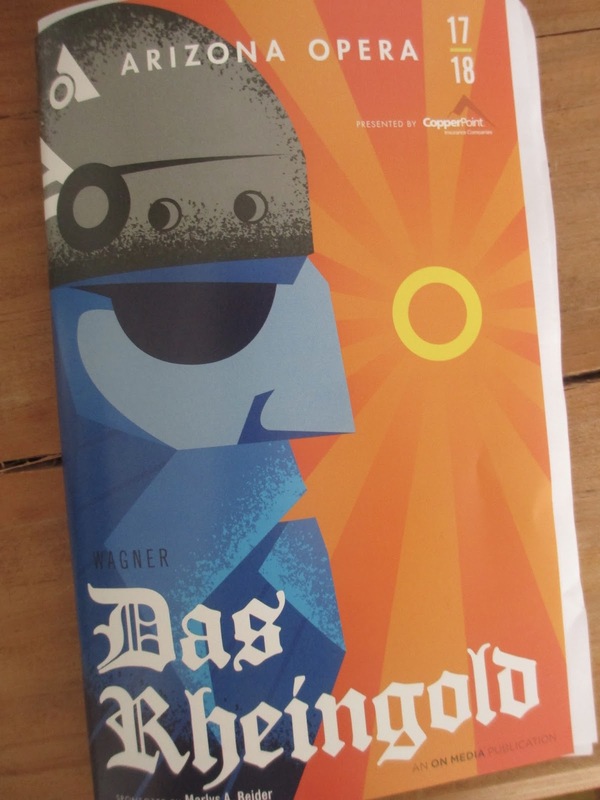 Before the show started, I overheard a conversation in which one person asked the other if they had to stay for the whole thing because they didn't want to listen to Wagner for that long. And after seeing the show, well, I get it. Instead of having the usual intermission, the opera was presented as one two and a half hour piece with just the four acts but no intermission, no breaks. Just one long piece. And whereas some operas have more recognizable "songs" in them, pieces that a singer or group of singers perform, all of the music here just kind of flowed into one long, unbroken train. Opera audiences usually clap all throughout at the different pauses. Here there was literally no clapping until the show water over; that was strange. So I do have to say that the long, drawn out style of the music and how it was put together didn't entirely suit me. This show, then, had that double effect: on one hand it was wonderful to watch, and on the other I kept wondering how much longer until it was over. It was a lot to take in without pauses and yet still it did end up being one not to miss.